It seems simple enough, but once you have ruined one or two batches of veggies, you might ask yourself: How do I grill vegetables? Unfortunately, it isn't as easy as slapping some cut or whole veggies on the grill and waiting until they are nice and tender. There are, in fact, a few key rules to live by when venturing with vegetables outside. Prepare vegetables according to the directions listed below. Each type of veggie will need its own special preparation, such as parboiling, trimming, or soaking. With a little proper preparation and a good set of accompaniments, you can make an entire meal out of grilled vegetables. Try them on pizza, toss them with cooked pasta, arrange on platters with a homemade balsamic vinegar dressing, add them to couscous or cooked rice, or mix them with feta cheese and top sliced French bread for a simple and delicious bruschetta. Wash vegetables thoroughly and cut them or leave them whole according to the list below. With tongs, or quick fingers, add marinated or oil-brushed vegetables directly to the grill. Alternatively you can thread cubes of veggies on kebab skewers or cook them inside a foil pouch. Smaller vegetables, such as cherry tomatoes or baby squash, will do better in a grill basket. Cooking times for each type of vegetable will vary. If they are on skewers or directly on the grill, turn the vegetables often and brush with more marinade or olive oil as needed. The vegetables are done when they can be easily pierced with a fork or a knife, and the knife or fork slides out easily. Watch veggies closely because some, like asparagus, tomatoes and peppers, can char easily. Asparagus: Slice off or snap off ends. Soak in water for about 30 minutes, pat dry with paper towels and brush or drizzle with olive oil. Asparagus can be placed directly onto the grill and removed when the tips just begin to turn brown. Alternatively, you can pile thin asparagus into a foil pouch with butter and parmesean and steam them on the grill. Bell Peppers: Cut each pepper in half, remove stems and seeds and brush with olive oil. Grill until charred. Cool and remove skins before eating. 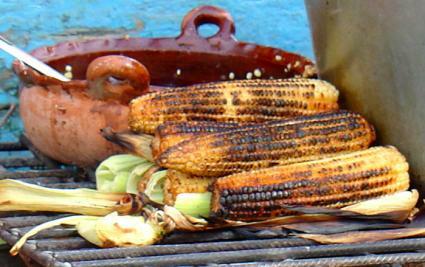 Place the corn directly on the grill for about 10 minutes, turning often so it doesn't burn. Eggplant: Eggplant is slightly more tricky to grill. You must either slice it into 3/4-inch slices or one-inch cubes and salt them thoroughly to leech out any astringency. Let sit for approximately 30 minutes and then squeeze and pat dry to release the bitterness. Cook the eggplant for a few minutes either in a saute pan or by roasting it in the oven. This will bring out the sweetness of the vegetable. Finally, skewer the eggplant on kebabs or place the steaks directly on the grill for about two or three minutes on each side. Tomatoes: With large tomatoes, cut in half and brush with olive oil. Grill cut side down for about two or three minutes or until grill marks appear. Potatoes: It is important to parboil potatoes prior to grilling them. Or, you can wrap them in foil and set on the grill for at least a half an hour.